Anyone who has been to Israel knows that the best place to get blended iced coffee is Aroma. In fact, I believe that Aroma in Israel makes the best iced coffee in the world. To be honest, it tastes more like a milkshake than iced coffee. It is a perfect blend of rich and creamy milk and a sweet coffee flavor with hint of chocolate. The best part is that you aren’t left with any icy slushy at the bottom of your cup since the drink is blended perfectly every time. Since I am a coffee obsessed individual, Aroma’s iced coffee would fit into my top three favorite things about Israel. What else do I love about Aroma? They were one of the first cafes in Israel to start carrying gluten free bread. When I visited Israel in September 2011, before the gluten free craze started spreading, I was pleasantly surprised to see that aroma offered sandwiches on gluten free bread. I was living in Paris at the time, where if you said you could not eat wheat, they pretty much spit on you. What a refreshing experience it was to sit and enjoy our haloumi cheese and grilled Mediterranean veggie sandwiches while sipping iced coffees and frozen lemonada! Instead of serving a fully prepared gluten free sandwich to customers, Aroma serves the bread wrapped separately in plastic with the fillings and accompaniments on the side- almost like a make your own sandwich. I can only assume that they had a bad case of cross contamination since they are not a gluten free facility. And now, to air on the safe side, they still offer gluten free bread but take every measure they can to keep it separate until it reaches the customer. It’s a less accommodating way to be served, but safety first! One of the highlights of our trip to Jerusalem was discovering the Kosher Moses restaurant at the new Cinema City. Moses is a popular Israeli burger chain with many non-kosher locations throughout the country, namely Tel Aviv. They are acclaimed for having some of the best burgers in Israel. Now, they also offer gluten free burger buns at all of their locations. We ordered a side of chips (French fries) and they prepared those specially gluten free as well. Casual dining with table service and a young cool ambiance. This burger joint is in the center of the city of Jerusalem, right off Jaffa St and close to the Mamila Hotel, Waldorf Astoria and David Citatel. It offers a full range of beef burgers, but only offers one gluten free beef burger option with a gluten free bun. I don't know why the other burgers can't be made gluten free- perhaps they use a filler. It's an easily located and in-expensive restaurant with a trendy vibe. Cookie cream is an ice cream shop that makes Belgium waffle sandwiches and sundays. They don't advertise anywhere in the store that they offer gluten free waffles, but we went inside just to check the ice cream flavors and Josh asked just out of curiosity if they have anything gluten free. The gluten free waffles are not readily available, but can be made fresh on the spot upon request. We had to wait about 15 minutes for the gluten free waffle. When it was finished, we picked our ice cream filling and toppings. The halva flavored ice cream was insanely good! The waffle on its own was a bit dry but with the ice cream filling and chocolate sauce and whipped cream toppings to moisten it up, it was delicious. 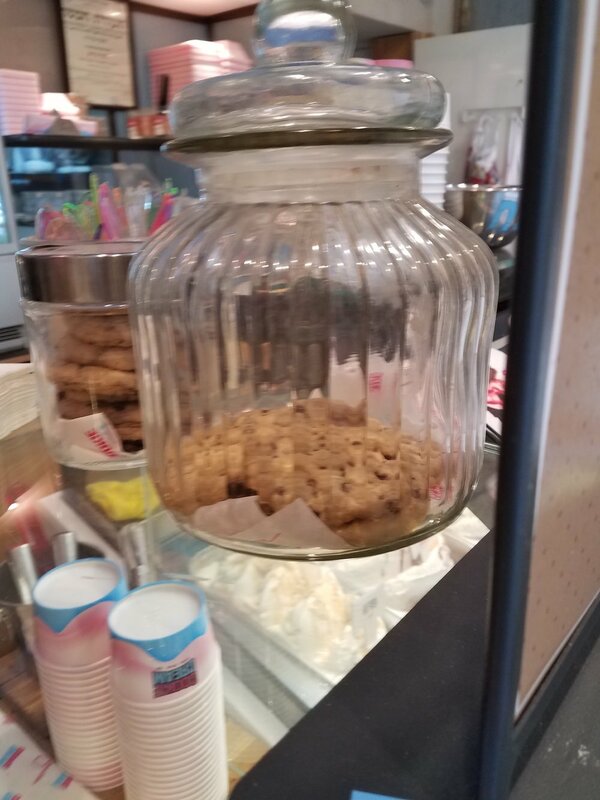 The manager was very accommodating and was eager to get our feedback on the gluten free waffle and the gluten free chocolate chip cookies (pictured in the jar). Crave was opened by the former chef from Herzog Winery in Nappa. Crave has lots of gluten free options with a cool vibe. The menu at Crave is based off ‘upscale street food’. You will find carnitas, fish tacos, brisket tacos, sliders, beer, cocktails, and more. Sandwiches include a kosher Rueben: house cured smoked brisket pastrami, spicy Korean kimchi, pickled onions, truffle sriracha mayo, and vegan cheese. There is a gluten free slider bun option and the tacos are served on homemade gluten free corn tortillas. We went to town on some beef sliders on the gluten free burger buns & pulled brisket and chicken tacos on the house made corn tortillas. The burger buns were just ok. They were slightly crumbly and were not very flavorful. The tortillas did not look so appealing because they are hand rolled, but looks can be deceiving! They were really delicious and soft. The brisket taco was especially tasty! 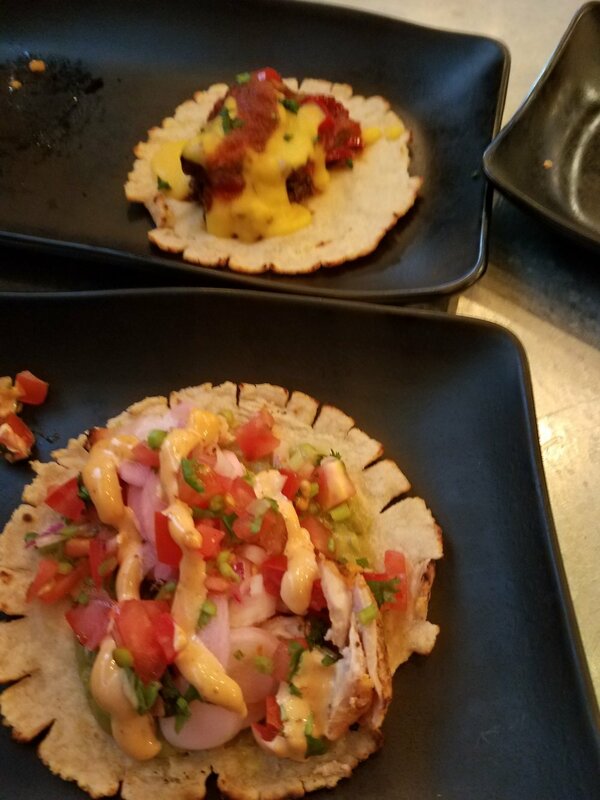 The chicken taco had great flavor and nice accompaniments, but it was served with baby chicken (pargiyot) which I wasn't a huge fan of because it was chewy. Walking inside the machaneh yehudah markets (The Shuk) we passed by this creperie that had a big sign in English and Hebrew that said "Gluten Free Savory and Sweet Crepes." It's a cool little stall with a few small tables outside. We were too full to eat a crepe there and then but will keep it on the list for next time. If you try it before me let me know how it is! We went on a search for some grub while we were waiting for our gluten free waffles from Cookie Cream to bake. We spotted Hasandak Pasta and Pizza restaurant nearby at the Machaneh Yehudah Markets (The Shuk). 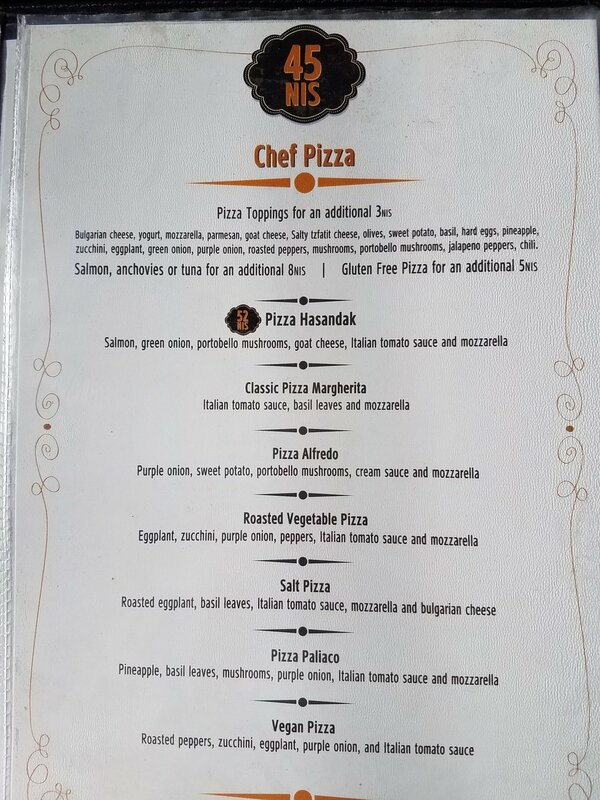 We were excited to see that the menu has gluten free pasta and pizza, especially since there are not a lot of gluten free pizza options in Jerusalem. They told us that they never got their delivery and so they didn't have any gluten free pasta or pizza available. We asked them if they normally have it available and they said yes, but they were a bit sketchy and evasive in their reply. I am suspicious that they may not always have the gluten free options available , since what are the odds that they were completely out of pizza and pasta. But if they were telling the truth, this restaurant is a great win for the gluten free community and visitors to Jerusalem! We'll try to check it out next time and try it out. Hopefully they'll have the product available!